Gracie Mansion - History - Government - Are We There Yet? The property had its beginnings as a farm in 1646, with only modest structures standing on the site for more than a century. Shortly after Jacob Walton, a wealthy Flatbush merchant, purchased the property and built a substantial house with a beautiful view of Hell Gate, General Washington commandeered the site for its strategic position. He built a fort here to guard the waterways. In September of 1776, the British destroyed both the ramparts and the house. 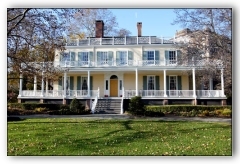 Finally, in 1799, Archibald Gracie built the main section of what is now called Gracie Mansion. Since that time the house has evolved from stately mansion, to a Dept. of Parks service structure, to the home of the Museum of the City of New York, and in 1942 became the first official residence of the Mayor. Robert F. Wagner had the privilege of being the first to reside here, and his wife, Susan, initiated plans to add another wing. The Wagner Wing was completed in 1966, two years after her death. In 1981, Ed Koch established the Gracie Mansion Conservancy to improve and maintain the beautiful property as a historic landmark, and the tradition has continued to this day. For individuals, Guided Public Tours are given on a regular basis. Guided tours for groups, including New York City (only) School Groups can also be arranged. The building has been beautifully restored, and decorated with period furnishings. Some of the most influential people in the world have dined here and visited the Mayor. The place has a lot of history, giving a tour much educational value. Hours: Public tours are given on Wednesdays only, from March to mid-November, at 10 & 11am and 1 & 2pm. School group tours conducted on Tuesdays and Thursdays, from September to mid-November and from March to June, at 10am and 11am. Reservations: Required for all tours, including family tours. At least 3 weeks in advance is suggested. Groups should reserve at least 10 weeks ahead. Handicapped Access:Accessible. Call for more details. Directions: East End Ave. at 88th St.